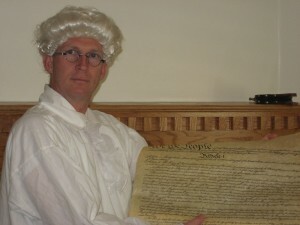 The University of Maine at Presque Isle will celebrate the 226th birthday of the signing of the U.S. Constitution with a unique “Living History” lecture delivered by Dr. Brent Andersen, an assistant professor of political science (adjunct) at the University. On Tuesday, September 17, from Noon to 1 p.m., students, faculty, staff and community members are invited to observe Constitution Day by gathering in the University’s Campus Center for the special lecture, which is titled How the States United: From the Declaration of Independence & Revolutionary War to the Constitution of the United States. Dr. Andersen will portray Alexander Hamilton, an aide to General George Washington during the Revolutionary War and later one of the principal architects of the U.S. Constitution. Dressed as Hamilton, Dr. Andersen will explain how colonial discontent with Great Britain led to the Declaration of Independence and the Revolutionary War. He will detail how hard lessons in self-governance learned during and after that war led directly to the 1787 convention in Philadelphia, where the U.S. Constitution was drafted. He will also discuss his service with George Washington during the Revolutionary War, and how this informed his thinking about the Constitution. After the prepared lecture, the audience will be invited to ask questions, which Dr. Andersen will answer as Hamilton. Dr. Andersen has presented similar living history events twice before. He had the idea for this special lecture after participating in a panel discussion during a past Constitution Day celebration at UMPI. Congress designated September 17 as Constitution Day – a national celebration of our country’s founding document – to commemorate the Sept. 17, 1787, signing of the Constitution. In 2004, Congress passed a spending bill that included a provision requiring every school and college that receives federal money to teach about the Constitution on Sept. 17, with a grace period should that day fall on a weekend or conflict with established schedules. To provide education to the entire campus community, the University will install a display on the first floor of the Library featuring information about the Constitution. As well, anyone logging onto the University’s homepage can click on the Constitution Day box, which will lead them to an interactive version of the Constitution at www.constitutioncenter.org/constitution. The Constitution Day lecture is a free event and the public is invited to attend. Pocket-sized printed copies of the U.S. Constitution will be distributed during the event. For more information, call 768-9452.